The United Nations Convention on the Rights of the Child (UNCRC) is intended to address the political, civil, economic, social and cultural rights of children everywhere in the world. In 1989, this Convention was widely adopted by governments worldwide in recognition of children’s rights and in making a political promise to acknowledge those rights in their national governance and international relations. According to UNICEF, only two countries have failed to ratify the UNCRC – The United States and Somalia. Wales, however, has taken specific measures in supporting the Convention. In 2011, the “Rights of Children and Young Persons (Wales) Measure” received unanimous support within the National Assembly for Wales. The measure sets out procedures for the Welsh Government to ensure the rights of children in Wales are addressed through the UNCRC. The Children’s Right Scheme in 2014 added further clarification to the policy, aiming to ensure Ministers have due regard to the UNCRC when exercising their Ministerial functions. As part of the WISERD Education study, a longitudinal study of approximately 1500 pupils in 30 schools across Wales, we have collected data on a number of themes relating to the rights of children and young people. I am particularly interested in how these rights are addressed (or not addressed) at school. While much of our data relates to a number of articles listed in the Convention, I focus on articles 12, 13, 28 and 29. Much of the literature regarding the rights of children at school include theoretical treatments of the responsibilities of schools in acknowledging and responding to the rights of children. While these exhortations are important in conceptualising the responsibilities of schools in addressing children’s rights, they often lack empirical evidence illustrating children’s perspectives on how their rights are known, considered and responded to by the school. So what does this mean for young people and children at school in Wales? Survey Items: How much do you agree or disagree with the following statements? 75% of our young people agreed their school cared about how much they improved in their studies. A smaller majority of pupils also agreed the school staff had high expectations of them (58.7%) and that their school rewarded their good marks or progress (69%). Encouragingly, the number of pupils disagreeing with most of these statements was quite small. However, items of concern include the low percentage of pupils who believe their views are listened to and taken seriously by school staff and that the school staff set goals they can easily achieve. The percentage of pupils disagreeing with these statements were also quite high in comparison to the other survey items. 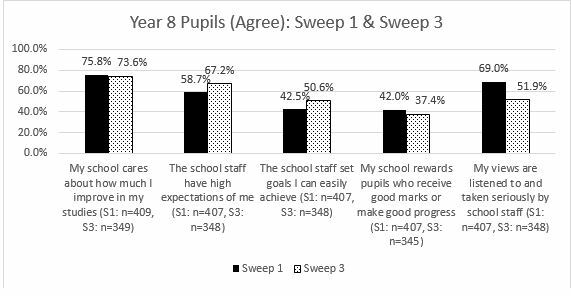 Since we also surveyed teachers during Sweep 1, I was interested to see if there was a difference of opinion between pupils and teachers in regard to these survey items. In looking at these differences, I compared the percentages of teachers and pupils who agreed to these items. The results are found in the chart below. As illustrated above, there is a significant difference between the teachers’ and pupils’ responses. More teachers and pupils agreed their school had a system for rewarding pupils who “work hard,” but there were substantial disparities between their responses in regard to pupils’ voice, expectations of pupils and appropriate educational goals. In addition to these results, I was interested to see how pupils’ responses might change over time, especially as pupils began to consider their GCSE options and life beyond school. In 2015, we surveyed our Year 8 pupils again, and when we did, we noticed dramatic shifts in some of their responses. While there were only slight differences in their responses regarding the improvement of their studies and systems of rewards at school, there were both positive and negative changes that were significant. For example, in Year 8, 58.6% of pupils felt their teachers had high expectations of them, while in Year 10, the percentage of pupils agreeing with this statement climbed to 67.2%. The percentage of pupils agreeing school staff set goals they could easily achieve also climbed. However, the percentage of pupils who agreed that their views were listened to and taken seriously by school staff dropped by almost 20 percentage points. In addition to changes in the percentage of pupils agreeing to these statements, there were significant changes in the percentage of pupils disagreeing with them. The shifts in opinion from Sweep one to Sweep three are quite stark. For all but two of the survey items discussed in this blog, the percentage of pupils disagreeing with a statement doubled (or nearly doubled). The differences between teachers’ and pupils’ responses, coupled with the shift over time in pupils’ responses to these survey items, call into question the ways in which schooling in Wales conceptualises the rights of young people and prepares teachers to recognise and engage those rights in the corridors and classrooms of our schools. The rights of children listed in the UNCRC are expressed in a dynamic nature – active and purposeful, which underscores the potential tension between the ways in which adults interact with children and how children express their rights. Schools are characteristically authoritative (authoritarian?) spaces organised, occupied and managed by adults, and the entrenchment of adult authority in the traditional organisation of school can leave little consideration for the autonomy of young people and the pursuit of their education. The Children’s Commissioner for Wales works to educate young people in regard to their rights, advises with children and their families about their concerns and acts as an advocate for children and their rights in Wales, and the fact that Wales has a Child Commissioner speaks to the intentions of Welsh Government in addressing the rights of children in Wales, but the visibility of children’s rights and the spaces in which these rights are engaged through the practices and discourses and schooling in Wales can always be improved. Where in the everyday discourse of schooling in Wales do we experience parents, pupils, teachers and policy-makers engaged in philosophical discussions of schooling and education that examine and critique the ways in which Wales accommodates the rights of children at school? For example, what is the degree of freedom or self-directed choice enjoyed by pupils when choosing their GCSE options? How might their right to actively participate in choices like these be contravened by over-reaching adult authority, either by parents, teachers or advisors? In what ways might local school policy or national educational policies, limit, redirect or even infringe upon the rights of children in school? Is it possible the unwavering focus on high-stakes assessment, the realigning of teaching from a pedagogical practice to “teaching to the test” and a dogged preoccupation with qualifications and school-ranking is eroding the spaces in which teachers and young people can dialectically discuss and exercise pupils’ rights? The unrelenting regime of examinations and inexorable emphasis on PISA results not only narrows the overall aims, purpose and conceptualisation of education in Wales, but may also serve to undermine the exercise and expression of pupils’ rights at school, conditioning them to a perpetual state of social and political reticence and potential ontological paralysis. Even the most seemingly mundane requirements of pupils at their local schools can have a potentially limiting and negative impact on their right to self-expression, quality education and development of personality, talents and ability. For example, how might the prescription of school uniforms and hair styles affect the rights of children? What about limitations on the items pupils bring to school (e.g. mobile phones, tablet computers or headphones), the areas where they congregate (in the corridors, on school grounds or even at the chip-shop across the street) and the ways in which they interact with each other and school staff (when to talk, what to talk about, even how to talk…)? Without careful consideration, the assumptions we accept in the organisation and control of pupil’s bodies and behaviour at school can negatively impact the recognition and accommodation of their rights. Curricular development and implementation — the very pedagogies through which teachers instruct their pupils and the content addressed through these strategies — can also truncate the range and depth of pupils’ (and teachers’) orientations to, perceptions and expressions of the rights of young people. For example, a common aim in Citizenship Education in Wales (a topic I address in my book Curriculum, Culture and Citizenship Education in Wales: Investigations into the Curriculum Cymreig) is to prepare pupils to live as active and productive citizens, rather than already considering them as existing citizens with active rights who contribute to society in a myriad of ways. As a result, citizenship, rights and civic and social participation are conceptualised as “adult” commodities that exist temporarily out of reach of young people. My initial analyses of the findings presented here suggest there is a lack of continuity between teachers’ and pupils’ perceptions of the pupils’ schooling experience. Moreover, for many of the survey items we presented to pupils, it seems their expectations of what the school should provide in terms of a learning environment that proactively and authentically engages their rights are not being met. To make matters worse, it seems these expectations drop considerably for some survey items the further young people progress through school. These early results need to be further analysed, and they will be discussed later this year at both the British Educational Research Association (BERA) and European Educational Research Association (EERA) conferences as this project progresses, but even in the early stages of analysis, the results arouse important questions about the prominence of children’s rights in the development of educational policies and classroom practices in schools in Wales, and how adults perceive and respond to young people’s rights of expression, education and development.